Well, just because these damsels have sought that status is it going to be within their reach? It is something which is inaccessible even for the hardest penance. These damsels know only to disturb and destroy the penances of the rishis. The sense-control needed for the hard penance is beyond their reach. So what do they do? They only try to achieve it mentally. 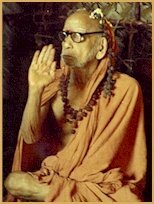 But that status indeed is not reachable even by the mind – ‘yan manasA na manute’ says the Upanishad, meaning, ‘What cannot be thought of even by the mind.’ The bottomline therefore is, even they cannot ultimately know the beauty of ambaal!